Anime Wednesdays - Nausicaa of the Valley of the Wind | It's not your tech, it's how you use it. This month for Anime Wednesdays I got to thinking first about an anime that was close to my heart that I wanted to share with everyone, but also found myself inspired when I learned that this particular title was finally out on Blu-Ray, although sadly not in the North American region. The story itself is probably the first post-apocalyptic tale I’d ever seen, and told of a future world that had suffered a human-made ecological collapse thanks to a massive but brief war that decimated human civilization: where the balance between humanity and nature is so drastically out of balance that humans have to stay in safe spaces and avoid the horrors they helped create, and of an Earth that’s now actively rejected them and denied them the wide domain they used to enjoy. Nausicaa of the Valley of the Wind (which I’ll refer to going forward as Nausicaa) is not just an anime classic – it’s very dear to my heart. I mentioned it as one of the first titles I remembered from my youth in What Does Your First Anime Say About You?, and it was definitely a formative story for me. Nausicaa was released in Japan in March of 1984, and never really in the United States (save a horrific June, 1985 bastardization of the film called Warriors of the Wind that really doesn’t deserve to be mentioned) until much much later. I was living abroad at the time, so I had the luxury of seeing it subtitled in English and on VHS, which was largely unheard of at that time, but I was lucky regardless. Nausicaa saw an unedited and uncut release in the United States again in 2005, when many people – myself included – fell in love with it all over again. I learned from the science and science-fiction blog Io9 that Nausicaa was out on Blu-Ray and it’s incredible, and it got me to thinking about whether I should pick up the disc and a Region-B player. Of course I decided against it, but I very well may pay for the Japanese import Blu-Ray that happens to have English subtitles. If you’re more familiar with more recent Miyazaki titles like Princess Mononoke, Spirited Away, and Ponyo, you owe it to yourself to see one of the films that inspired those following films, and while Nausicaa was made before Studio Ghibli was formed, was one of the first films that Miyazaki collaborated on with Isao Takahata and Toshio Suzuki, and the three of them would go on to found Studio Ghibli together. Nausicaa represents one of the first films that brought together a number of the ideas and visions that become such incredible trademarks of Studio Ghibli, and of Miyazaki’s work – themes of environmental stewardship and the eventual woe that will befall a human race that strays too far from balance with nature maglie calcio and with itself, the horrors of war, and the battle between greed and peace, and how subject we all are to the forces of nature. Oh, and if you’ve ever studied some of Hayao Miyazaki’s inspirations or seen an interview with him, you’ll know that there’s one element that he always tries (and as far as I can tell, always succeeds) in getting into his stories: flight. 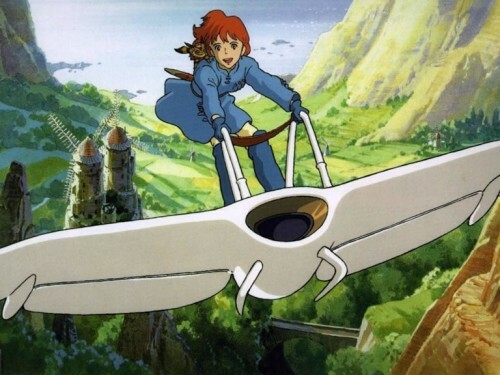 He loves flight, and Nausicaa is no exception to this rule – Nausicaa on her glider, the flying airships of the various human nations, the wind ripping through the valley – it’s all there. Nausicaa doesn’t have some of the spiritual elements we’ve come to see from a number of Ghibli titles, but it does take us to a world that we don’t really want to visit: a world of our own potential making if we don’t change our ways. In that regard, the story is very definitely a cautionary tale, serving as a very stark reminder that the Earth can be a cruel and harsh mother, and if we don’t retain our balance with her, honor her, and protect her, we could find ourselves on the other side of the coin from the luxury and dominion we enjoy today, struggling to survive thanks to our own foolishness and carelessness. The environmentalism rings loud in Nausicaa, but never in a preachy or overly intrusive manner – the story whisks us forward in time and reminds us that it was our own ignorance that ended our world, and the story explains to us fully that even in the face of certain extinction humanity’s greed and lust for power can only be countered by humanity’s capacity for love and perseverance. We’re constantly reminded in Nausicaa that when good people are good because they’re pure of heart and noble of spirit, and evil people are hardly ever innately evil: they simply do evil things; not because they’re not redeemable, or because they don’t feel they’re doing what’s best. If you want to pick it up, Nausicaa of the Valley of the Wind is available at Amazon easily in a 2-disc special edition. Sadly, the film in Blu-Ray isn’t available in our region quite yet. The story takes place one thousand years after the “Seven Days of Fire”, an apocalyptic war which destroyed human civilization and most of the Earth’s original ecosystem. Scattered human settlements survive, isolated from one another by the Toxic jungle, a forest of giant plants and fungi swarming with giant insects, and other arthropods which seem to come together only to wage war. Everything in the Toxic Jungle including the air is lethally toxic. NausicaÃ¤ is a charismatic young princess of the peaceful Valley of the Wind. Although a skillful fighter, NausicaÃ¤ is humane and peace-loving. She has an unusual gift for communicating with the giant insects (particularly with the Ohmu, gigantic, armored, caterpillar- or isopod-like insects who are the most intelligent creatures in the Toxic Jungle.) She is also noted for her empathy toward animals, humans, and other beings. An intelligent girl, and Maglia AC Milan inspired by the Valley’s Lord Yupa, a wandering warrior possessed of great wisdom, NausicaÃ¤ frequently explores the Toxic Jungle and conducts scientific experiments in an attempt to define the true nature and origins of the toxic world in which she lives. Her explorations are facilitated by her skill at “windriding”: flying with an advanced jet assisted glider craft. Yupa is searching for the mythological man in blue who, according to the legend, will appear surrounded by a sea of gold and reunite the people and nature. Without going on too much more, you already see some of the central themes coming together here. Humanity is restricted to safe areas that are outside of or beyond the Toxic Jungle, also referred to as the “Sea of Decay,” where everything – including the air – is poisonous and offensive to human life. The Earth herself has turned against humanity in the wake of the destruction of the ecosystem. To digress for a moment, this vision comes up in my head frequently when I hear excuses from people who don’t care much for environmental protection. The nihilistic excuses usually range from “The Earth will survive without us,” and “It won’t matter eventually anyway,” as if the damage that we’re doing is simply a phase in a changing Earth, and that we should have little interest in preserving the environment since it’ll inevitably change anyway. The problem with this logic is that it assumes that the environment is and will always be this docile thing that we can pretend to be immune from and live on top of. In Nausicaa, the environment that we so foolishly ignored has promptly turned on us, and is pushing us further and further to the brink of extinction. Amidst all of this anger and frustration at the expanding ecological disaster that threatens every human settlement and community left in the world is Nausicaa herself and the peaceful people living in the Valley of the Wind, people who hate to see the world this way, and are frustrated at the expanding toxicity just beyond their community and stands as a threat to their survival. Nausicaa is more interested in the hows and whys that surround the Sea of Decay and its ever-expanding grasp. She risks her own well being to fly into the Sea on her glider to collect samples, perform experiments, and try to understand why the world is behaving the way it is. She seems to have an affinity for the natural world, and an uncanny ability to communicate with and calm the creatures that live in this strange and foreign place. Unfortunately, crashing into this world comes humans from afar, disrupting the peace and unveiling a plot that could very well destroy them all in a mad dash for power by one faction far away with the technological might to reach for it. Again we’re shown a humanity that uses its ingenuity, technological advancement, and skill to try and dominate nature and push it back into submission rather than live harmoniously with it, and the battle between the forces of peace and understanding against the forces of subjugation and power begins. Nausicaa and the people of the Valley of the Wind are forced to not only defend their homeland with whatever strength they can muster against enemies stronger and with more resources than Maglia Inter Milan they have, but as the story progresses and we’re introduced to more characters and more people from different places around this new world who are facing the same conflict, we learn that there’s more at stake than just the Valley. What follows is a story of betrayal and sacrifice, of a conquering people with strength and might but short-sighted ambition and another rebellious people who are desperate for their freedom but who regain it at the cost of their own civilizations. We are confronted with sects of humanity who are eager to act without thinking and who are convinced that the ends – even if only in principle – justify any means to obtain them. Nausicaa is ultimately a story of redemption and hope, as most of Miyazaki’s stories really are – so while Miyazaki never shies away from bittersweet endings, happy ones, or even unsettling ones, the one thing I can give away about Nausicaa is that the ending is surprising, engaging, and so incredibly emotional that it’ll have as much of an impact on you that it did on me all those years ago. Frankly, there’s nothing about just about any Miyazaki story that’s not to love – if you’ve loved any Miyazaki title since Nausicaa and want to benefit from one of the titles that started it all, this is the story for you. The emotional resonance, the way Miyazki and his team hold the story together with evocative imagery, an incredibly cohesive plot, and incredibly detailed animation – even for the mid 1980s. And I’m not saying this in that whole “oh the 80s animation is horrible by today’s standard but you might find it a little nostalgic” way, I’m saying that if Nausicaa found a theatrical release today, it would look just as gorgeous and stand up to a number of titles that have been made more recently. The fact that the Blu-Ray has been released overseas implies that we may see a Blu-Ray release in the United States soon. Even so, Nausicaa is a beautiful story that combines some of the best themes that we’ve seen in stories since then both in anime and in other film. You’ll get to see some of the inspirations for the stories that you saw in Porco Rosso, Kiki’s Delivery Service, and Princess Mononoke. Even if you’re not already a Miyazaki fan – and trust me, I’ll discuss other Miyazaki titles in future Anime Wednesdays segments – Nausicaa is a great title to use to get started exploring the Ghibli (or even just the Miyazaki) body of work. Another reason to love Nausicaa is that it’s one of those anime titles that’s great for getting into the medium, even if you’re not a big anime fan. Looking for an anime title to show your friends who don’t get why you like it so much, or the significant other in your life who just doesn’t get your obsession with the medium? This is the movie for them. The same can be said about many Miyazaki titles, but there’s something really honest and open about Nausicaa that doesn’t require, for example, a depth of knowledge or desire to experience the spiritual aspects of Spirited Away or the historical influence you’ll see in Princess Mononoke. It’s a perfect title that blends science fiction and high fantasy, raw emotion and strong characters – especially a strong female lead in Princess Nausicaa herself, and an almost perfect blend of storytelling that keeps the message and the storyline front and center without getting preachy or overbearing on any front. You see technology as a tool – to be used for good or ill – in Nausicaa, so you can’t blame it for humanity’s problems here; you can’t blame the weapons in the film either, or the natural world that’s turned against humanity, or the insects that come together to wage war and trample everything in their path. What’s so incredibly clear and present in Nausicaa are the characters: the antagonists use their tools to do bad things, and that’s what puts them on the other side of the line: their intentions, their desires, and the way they achieve them. The protagonists on the other hand are great because of the way they rise to meet their challenges; they face their situations with confidence in their beliefs and in what’s right, and they don’t shy away from doing the right thing, even if it’s difficult or nigh-on impossible, and that’s why we love them. We don’t so much hate the antagonists for trying to achieve their desires as we love the heroes (and heroines!) for what they do to achieve theirs. I could go into why Nausicaa is so timely as well – the story of war and environmental destruction, humanity paying a hefty price to a world they sought to dominate and yet still fighting amongst themselves, squabbling for power and authority and many still looking for new ways to dominate the world around them – but frankly, it’s all right there in the story. Those parallels are easy to draw, and when you see Nausicaa you’ll fully understand exactly how telling the story is. I’m waxing rhapsodic about the story partially because it was so formative for me, but partially because I know these are some of the lessons you’ll take away from Nausicaa when you watch it. You’ll fear for our future, put your faith and hope in our children, and you’ll definitely start recycling more, planting more trees, and you’ll certainly remind yourself that the we’re the only ones who can change our future: no mystical hand or force is going to swoop into save us from ourselves – and I think that’s a central point in many of Miyazaki’s stories: humanity is its own worst enemy and greatest asset. I would hardly say that Nausicaa is an overlooked title, it’s definitely a classic, but it’s worth revisiting, and if you’re not familiar with it, it’s definitely worth picking up, either on DVD or checking it out on Netflix. Your reward is a compelling story and intense visuals that stand up to the test of time and are worth seeing again today if you’ve seen it before, and worth seeing for the first time if you’ve never seen it before – which is an incredible statement when you remember that Nausicaa of the Valley of the Wind was released 16 years ago. I promise, it’s a great selection as a first anime or your fiftieth; there’s a reason you can still find most anime conventions playing it somewhere in a viewing room on a large screen at some point during the event. Excellent review of one of my favorite movies! I agree, it's worth a watch, even by non-anime fans.